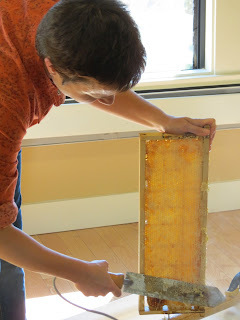 Yesterday our resident Bee Keeper, Paul Koski guided 15 volunteers through the delicate art and science of harvesting honey. We collected 50 lbs of light, floral and perfectly sweet honey! It will be on sale in a couple of weeks! All the funds raised from the honey sales will go to benefit the Graze the Roof Project. ...and, "Thank You to the Honey Bees!" Wow, that’s a lot! This Graze the Roof Project is just incredible. I know you’re not the only one culturing honeybees up on the roof. But you’re certainly one who has productive results to show. Congrats! I have a question though. Isn’t the wind a trouble to keeping bees on the roof?